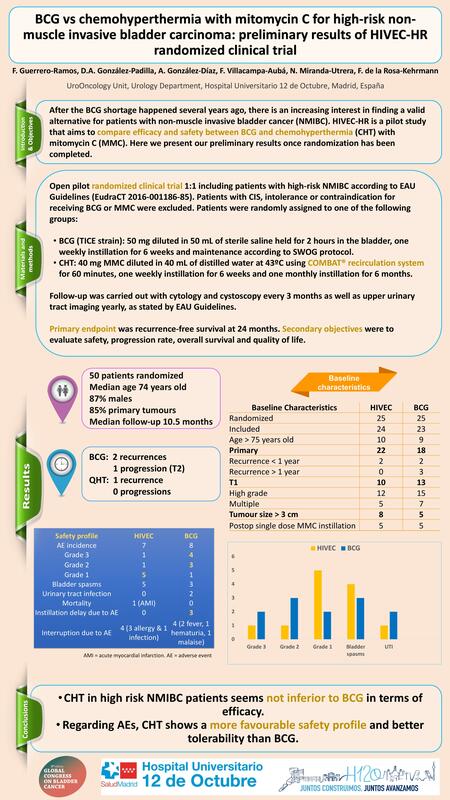 After the BCG shortage happened several years ago, there is an increasing interest in finding a valid alternative for patients with non-muscle invasive bladder cancer (NMIBC). HIVEC-HR is a pilot study that aims to compare efficacy and safety between BCG and chemohyperthermia (CHT) with mitomycin C (MMC). Here we present our preliminary results once randomization has been completed. Open pilot randomized clinical trial 1:1 including patients with high-risk NMIBC according to EAU Guidelines (EudraCT 2016-001186-85). Patients with CIS, intolerance or contraindication for receiving BCG or MMC were excluded. BCG (TICE strain): 50 mg diluted in 50 mL of sterile saline held for 2 hours in the bladder, one weekly instillation for 6 weeks and maintenance according to SWOG protocol. CHT: 40 mg MMC diluted in 40 mL of distilled water at 43ºC using COMBAT® recirculation system for 60 minutes, one weekly instillation for 6 weeks and one monthly instillation for 6 months. Follow-up was carried out with cytology and cystoscopy every 3 months as well as upper urinary tract imaging yearly, as stated by EAU Guidelines. Primary endpoint was recurrence-free survival at 24 months. Secondary objectives were to evaluate safety, progression rate, overall survival and quality of life. Fifty patients have been randomized (100% recruitment completed), with 47 finally starting treatment. Median age is 74 years, 87% were males and 85% were primary tumours. Baseline characteristics were comparable in both groups. Median follow-up is 10.5 months from TURBT. For the BCG group, 2 recurrences and 1 progression to T2 were reported, and only 1 recurrence and no progressions happened in the CHT group. Regarding safety profile, adverse event (AE) rate was similar in both groups (8 AEs in the BCG group and 7 for CHT), but more severe for BCG patients (CTCAE grade 2 & 3) and 3 instillations postponed in this group due to AEs. Four patients in each group discontinued treatment due to AEs. According to our trial preliminary results, CHT in high risk NMIBC patients seems not inferior to BCG in terms of efficacy. Regarding AEs, CHT shows a more favourable safety profile and better tolerability than BCG.